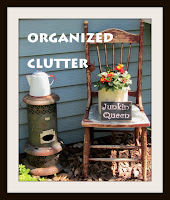 The idea for a re-purposed clipboard Christmas tree ornament came from Funky Junk Donna. Yes, I was inspired by Donna's clipboard on her White Christmas Tree of Gratitude. 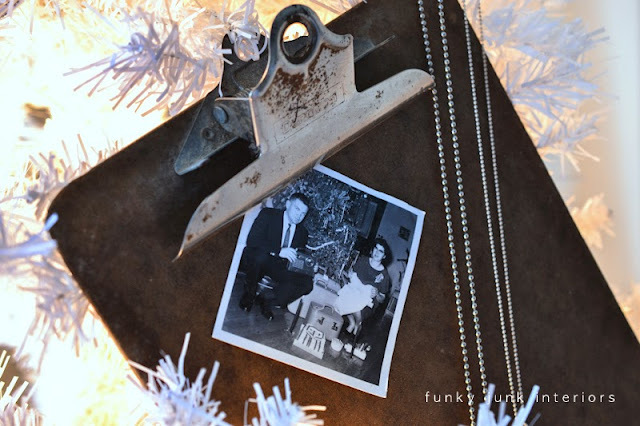 Donna used a full size vintage clipboard and displayed a black and white Christmas photo of her parents. I wanted to use a smaller version of this idea so I purchased a cheap clipboard from Kmart for $1.69. The new clipboards are much more flimsy, lighter in color, and have a different type of clip than the older ones. As you can see, the clip has been cut off and the board cut into fourths. Next, I used a piece of sandpaper to round out all the corners and smooth the newly cut edges. I darkened the clipboards with some Old English Furniture Polish with scratch cover. I then used a bulldog clip tied with a short piece of ribbon to finish my projects. It's me, circa 1962 with my little brother and our aluminum tree! The little tree on the left on top of the round metal plant stand is made from netting. This is also an old 1960's Christmas photo card of my cousins. Besides Christmas photos, favorite or vintage Christmas cards would also be fun! My re-purposed tree may not be the most beautiful tree in the world but I think it will be fun! Great job cutting the clipboard! I love this idea! You can change out the photos each year also. I may try to make something like this for Tiger's tree and put his photos on it! Fun! What a great idea. Can't wait to try it myself. Love the vintage look of these. What a great way to display old family photos. I love these little clip boards used as tree hangars. I was actually searching for ideas for a Thanksgiving Tree and think these would lend themselves well to that...maybe have photos of loved ones or write what we are thankful for on a little note paper or leaf shaped paper. Thanks so much for the inspiration! What a cutie you with your little brother. I love this idea as I think a full size clipboard would be a bit big...leave it to take the original idea to a new level! I have all I need for this one too! Well....except time to do it! LOL! What a FABULOUS idea! You've certainly inspired me with this one, can't wait to go and sort our some clipboards! Another great project that I never would have thought of...mini clip boards! They do make cute ornaments! How cute are you with your holiday dress and even a necklace! So....do you have that aluminum tree? or the netting one? I LOVE this idea! Thank you so much for sharing it! These are just so cute and little and cute--did I mention that? I love vintage office.....great idea! Would have loved to see a picture of a full tree decorated!